Hi there, awesome Friends! Jack sends a huge thank you for all the super sweet comments on his plant stand makeover I shared on Tuesday! He was grinning form ear to ear. 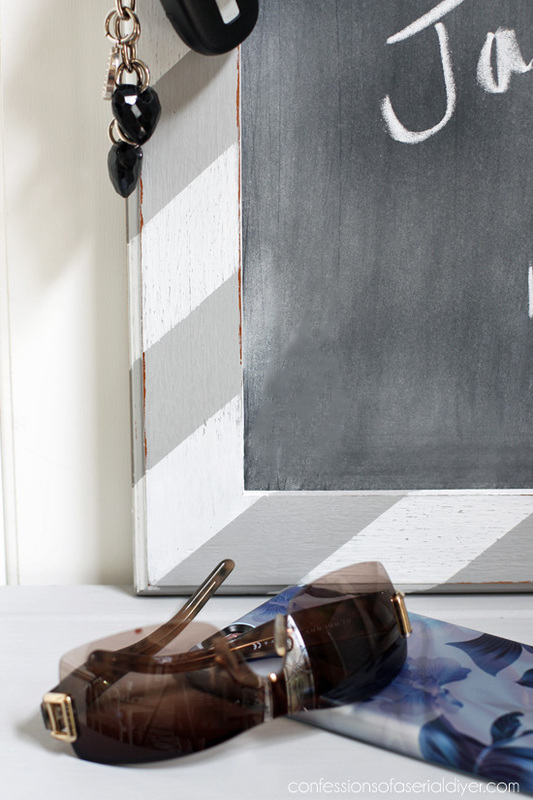 Are ya’ll up for another thrifty makeover today? I thought you might be. They’re my favorite too! This one was actually a collaboration between me and Jack. He dug through my to-do pyramid and pulled out a little shelf I found at the thrift store for two dollars a while back and started going to town painting it. Then I came to see what he was up to and it was like slow-mo…No-o-o-o-o…we…n-e-e-d…a…bef-o-r-e…ph-o-t-o-o-o-o. Ha ha too late. Brown. This was after one coat of leftover Sparrow by Behr that I had made into DIY chalk paint a while back. He was just going to paint the shelf and call it a day, but I thought it could be more unique than just a dated shelf with a new paint job, so we went in search of a frame to attach to it and found this simple one at the thrift store. 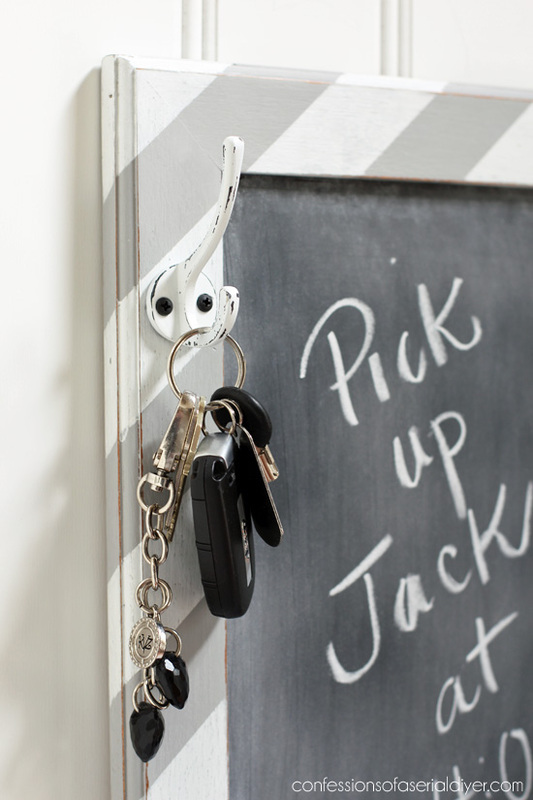 This makes a great landing spot for keys, mail, etc. 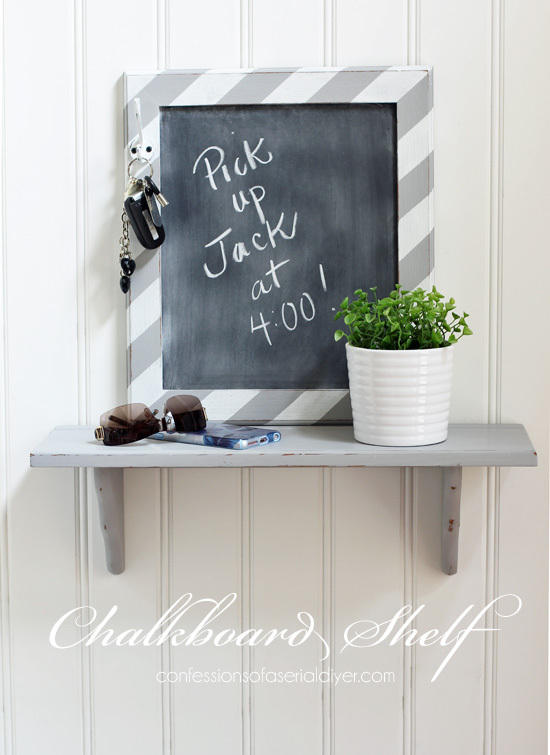 For more info on how the chalkboard was made and added, check out THIS post. 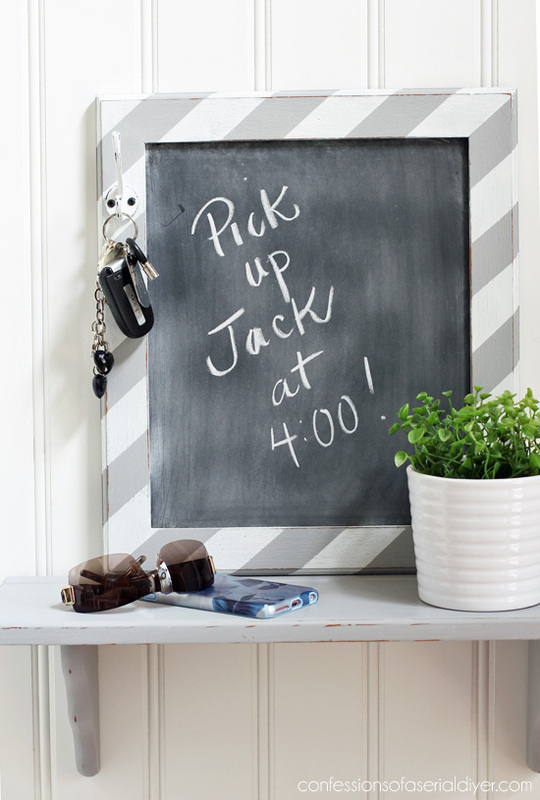 I like to use Rust-Oleum Chalkboard Spray Paint . 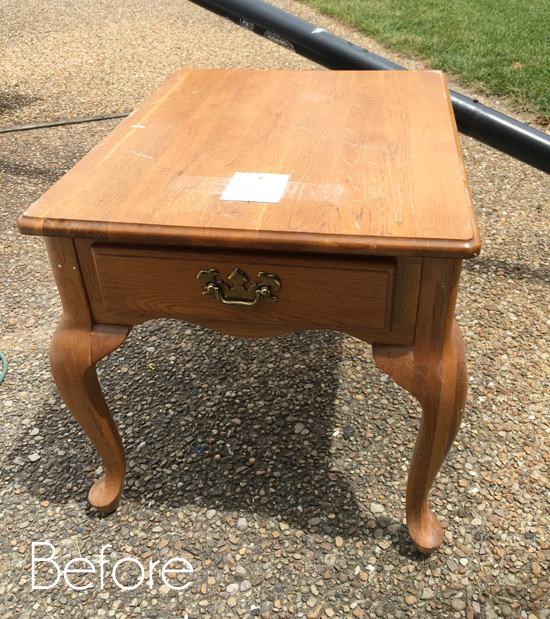 It only takes a couple of coats and it goes on so easy and covers great! And I waxed with Annie Sloan’s clear soft wax to seal. I just bought her white wax. Can’t wait to try it out! I though about adding a bar across the bottom of the shelf to add a couple of hooks to for hanging your purse or coat, but decided to leave it as is. As you can see I covered the ugly on the back in brown wrapping paper I found at TJ Maxx. I attached it using Matte Mod Podge like a glue. Sometimes I use hot glue or a glue stick…whatever I have near me at the time! I have also found that if I line the paper up in one corner, I can just sand the other two edges and it tears perfectly along each edge. It was fun working together on this one, and I think it turned out pretty darned cute! Two forgotten thrift store throw-aways that cost around $5 became an updated and functional piece of décor! UPDATE: See how them now HERE with their new makeover! Your son did a great job! It’s always nice when you can get the family involved. That is so sweet to see your son doing this with you, he did an amazing job on that table! These are great D I Y’S always fun to see the outcome Christy have a great day with your son !! Uh oh, I think you’ve got a DIYer on your hands…lol. Good job with the shelf and jazzing it up. Love it! I’ve been looking for inspiration for my olspd shelves. I love this idea! Going to pin it! Great job! My son will be a Junior this year and he still has his mom moments but they are few and far between these days. Enjoy while they last. I noticed you put a hanger on the frame. Does it hang by that hanger or that one plus the ones on the shelf? Thanks for the great project! I always look forward to your post, you inspire me to try new things. Beautiful! Another piece that’s going to fly out the door. Jack just needs to remember that he’s doing this in service of the blog and that you need your “before” pictures before he creates a masterpiece! You may have created a monster…he may have the ‘bug’ now! Great project! I never would have thought of attaching the frame to the shelf, and love it! 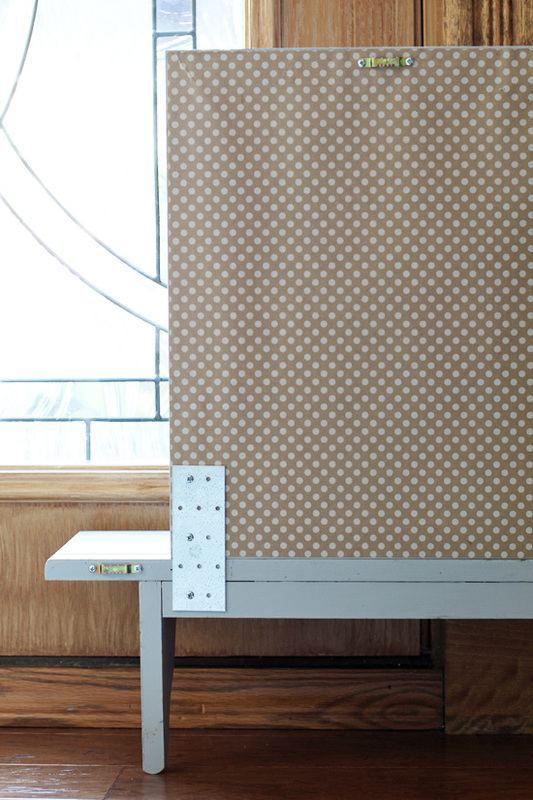 It has a more “decorated” look than a plain-jane utilitarian look… or something like that. 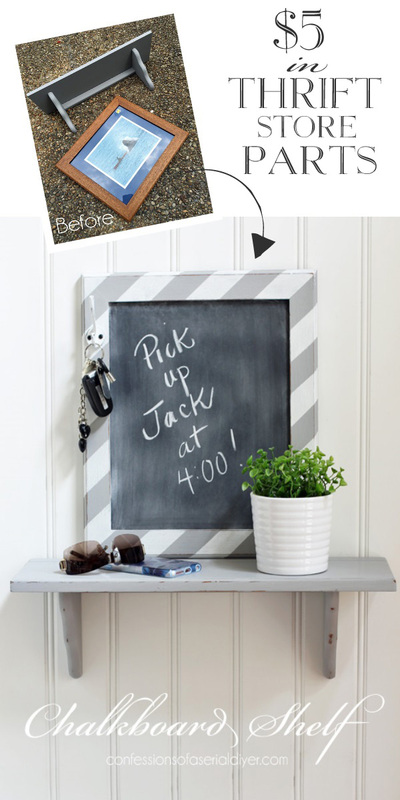 : ) It has me wondering if I need a self/chalkboard somewhere in my house. : ) Houses do not have enough wall space!!! 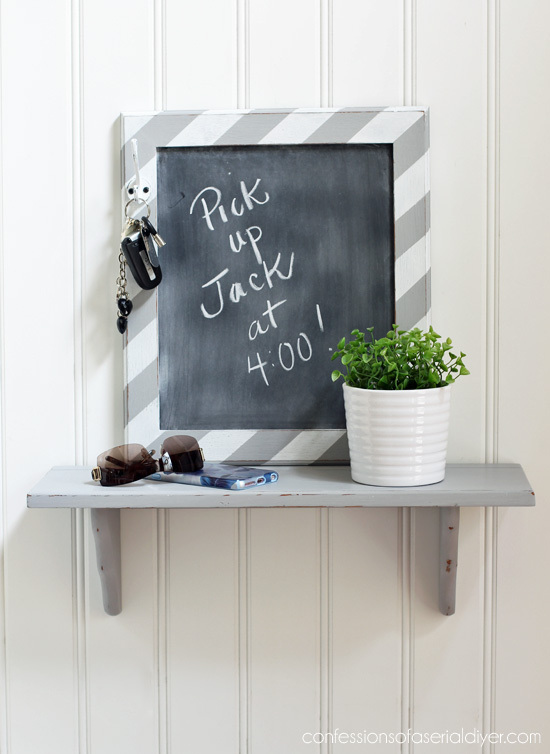 The little shelf and chalkboard are adorable, they have a beachy look for sure. I think it is wonderful how Jack is really getting into this and you know whatever road he takes in the future, these are skills he can always use. Good job mom. He is doing such a great job with the makeovers! I’m jealous… I wish I had a project partner! :o) I love how you guys added the framed chalkboard, that’s a great way to give a plain ol’ shelf oomph!! Thanks, Tania! He really surprised me with his interest in redoing a few things, and it is fun having him to team up with! Another great job from Jack! It’s so much fun to see your kids be creative and yes…enjoy it while you can! After you remembered to pick up Jack at 4 o’clock he did another fabulous job helping Mom with this upcycle! 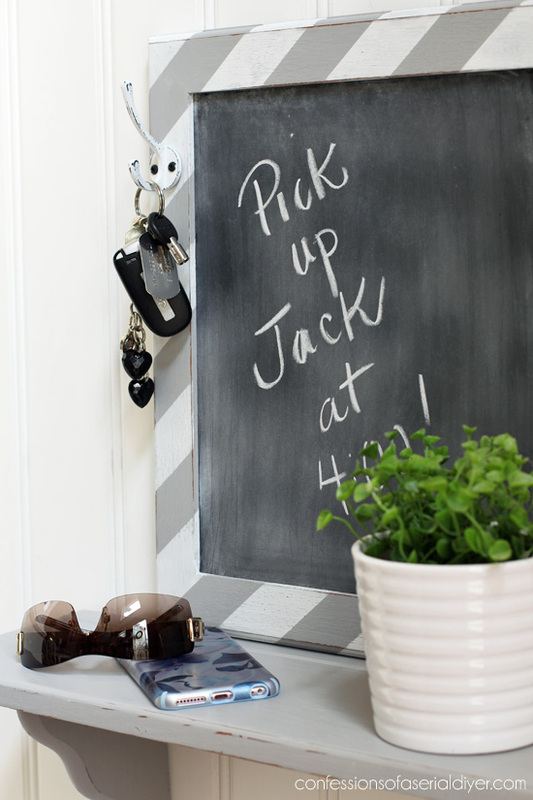 Love your idea of attaching a chalkboard and the stripes add a fun element. 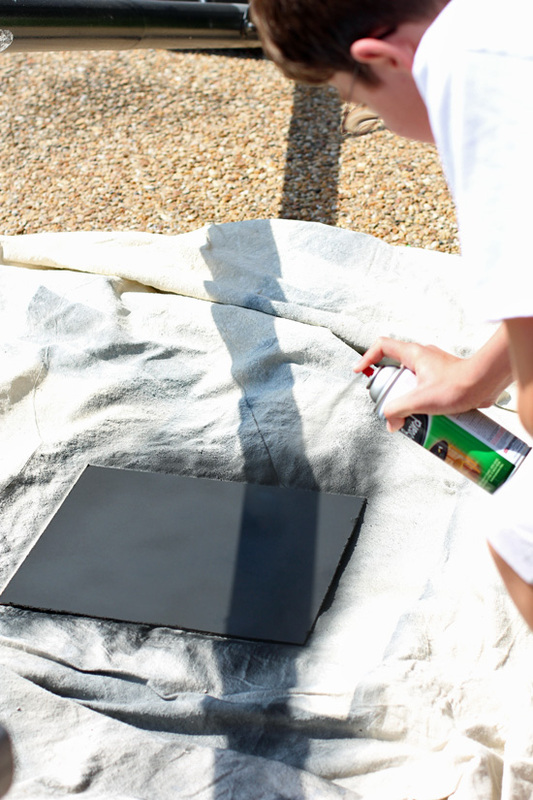 After my can of chalkboard paint is empty I’m switching to the spray paint variety. I’m done with rolling the stuff on – you had me at “two coats”. 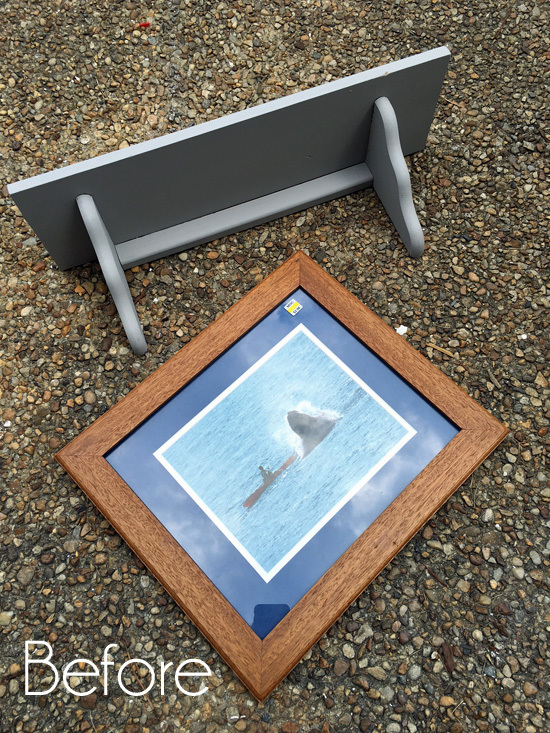 Thanks for the photo of how you attached the frame to the shelf. And I really liked the stripes. Sometime soon I’m going to try the same thing. Thank you! This little shelf is darling! I love that you and your son are working together on projects. You both will always remember this time spent together. 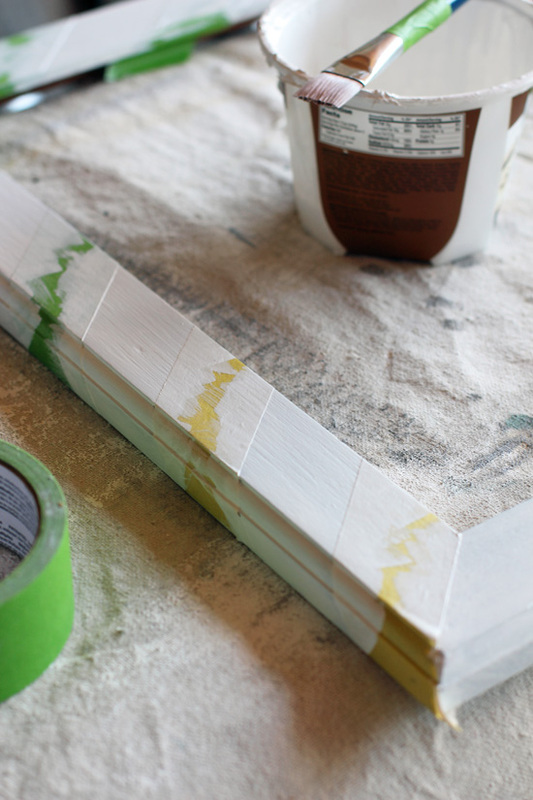 Super useful tip on lining up the back of the paper and sanding off the edges:) I’ll have to remember to try that because getting the paper straight and cut right is always a hassle!